Factual error: Their complete and utter disregard for the most basic scientific facts in this movie is amazing. It's already been said that Gary Sinise couldn't possibly have recognised the DNA sequence as human (that segment may have been enough to produce a single protein common to any lifeform). The thing that gets me is that he recognises that the DNA is missing a couple of "chromosomes" to complete it. DNA is made of units called nucleotides (remember A,T,C,& G? ); chromosomes are formed by huge strings of DNA wound together (not the other way around). You don't need a degree in Biology to know this, you just need to have stayed awake in high school. Factual error: The atmosphere pressure of Mars is 0.07 Bar, Earth is 1 Bar, about 14 times greater. Yet the plastic covering of the greenhouse is shown flapping with the outside breeze. With the inside of the greenhouse having an Earth-like environment its plastic covering would have been inflated like a balloon against the weaker Mars atmosphere. Factual error: The young guy builds the "woman of his dreams" with M&M's in that space ship. The double-helix rotates around its own axis, though it wouldn't do so - even in zero gravity. 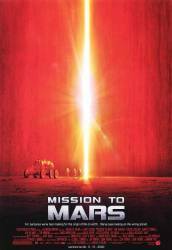 Factual error: There are scenes showing the astronauts battling against a fierce Martian wind. In fact the atmosphere is so pathetically thin on Mars that even a 200mph wind would feel like nothing more than a gentle breeze. Continuity mistake: At the moment where you can see Gary Sinise is standing in the white surroundings filling up with water (he's going to be drowned), you can see the camera team reflected in the little mirror. Factual error: The crew of the rescue mission abandon ship after the engines explode. They then rendezvous with a supply module that's already been in Martian orbit. The problem is that the engines exploded just as they were attempting an orbital transfer a from solar orbit to a Martian orbit. As they were unable to make the necessary burns to slow down and correct their angle to complete the transfer, they wouldn't stay in the vicinity of Mars for very long at all. Plot hole: When Tim Robbins is floating away in space his wife could have easily saved him. She could go out a little further, use the grappler to catch her husband, then use the fuel she has remaining to halt their acceleration towards the planet and return them partway to the necessary orbital altitude/velocity to rendezvous with the resupply module. Then, Gary Sinise could come out partway to them using his thrusters, Connie could shoot the grappler out to him, and he could reel both Connie and Tim Robbins back in to the resupply module. Continuity mistake: In the scene where they have first entered "the Face" they realize they can take off their helmets. Before they do so, you can see there are tubes going from the backpacks to the helmets, but when the view changes to an overhead shot, the tubes are nowhere to be found. Continuity mistake: How could Gary Sinise see the reflection of Don Cheadle's hand in the water, when they first met in Mars? Don Cheadle was two or more steps behind his back, so it could never happen that way, unless Don was in the roof, jumping over Gary Sinise. Factual error: The supply vehicle landed by a parachute as it is seen deployed on the ground. Mars has an atmosphere that is approximately 1% as dense as that of the Earth. The parachute shown is nowhere near large enough to slow down the landing. In fact, it is greatly smaller than a chute needed to land even in earth's atmosphere. Jim McConnell: They're us. We're them.